As a mother I faced a lot of problems when it can came to feeding my kids, especially my eldest daughter. Sometimes it becomes hard to make kids eat the regular food, roti-sabzi. Here's a quick fix for all you mothers to make them eat what you want while they enjoy it too. Cut chapati into 4 pieces, heat oil in a pan and roast the chapatis till they turn crisp. Mix pesto in the sabzi and grate cheese in it. 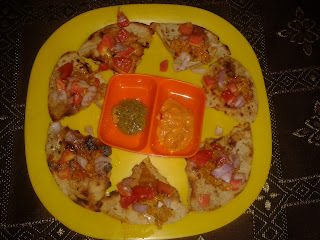 Spread the sabzi on roasted chapatis, top it with chopped tomatoes, onion and cucumber. You can garnish it with more cheese if you wish. serve it to the kids with a glass of milk shake. I am sure they'll love it. If your kid doesn't like pesto you can use salsa dip or plain tomato ketchup instead.